The suicide prevention charity has been given a new look by Spencer Du Bois, which looks to help make it more appealing to younger audiences while highlighting what it offers beyond its listening service. 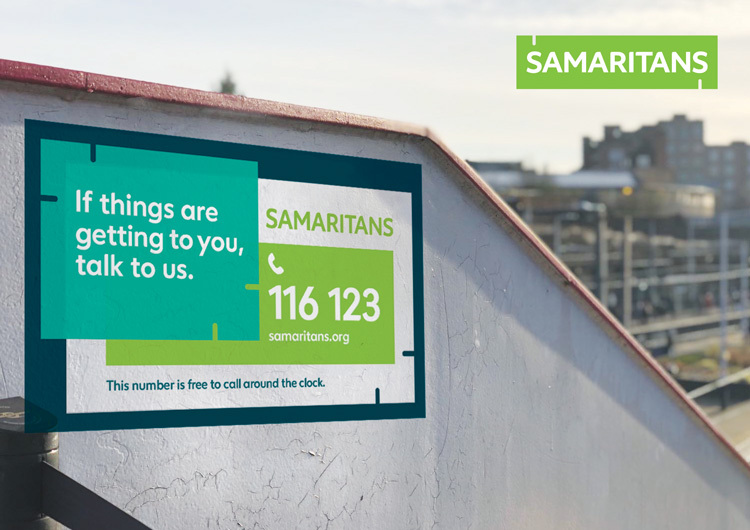 Emotional support charity the Samaritans has been rebranded, in a bid to help it appeal to young people and convey its range of services beyond its phoneline. 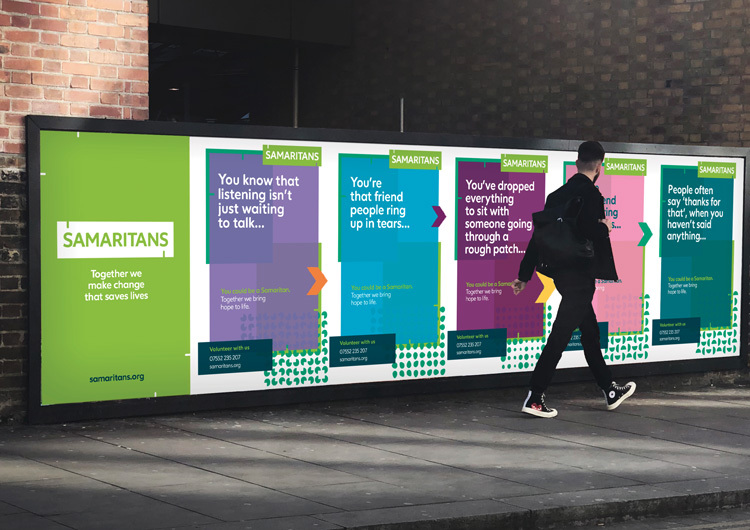 Studio Spencer Du Bois has completed the rebrand, which took 18 months in total, and included focus groups with different Samaritans audiences, including callers, volunteers, supporters and donors. The charity was originally founded in 1953 by vicar and part-time cartoonist Chad Varah, who had been motivated to offer informal counselling to his parishioners after he conducted a funeral for a 14-year-old girl who had committed suicide. Eighteen years later, he founded the Samaritans to try to save the lives of more people who were contemplating taking their own life. The charity now has 20,000 volunteers across the UK and Ireland and answers a request for help every six seconds on average. According to the charity, there were over 6,000 suicides in the UK and Ireland in 2017, while the World Health Organization (WHO) found that suicide was the second biggest cause of death for those aged 15-29 globally in 2016. 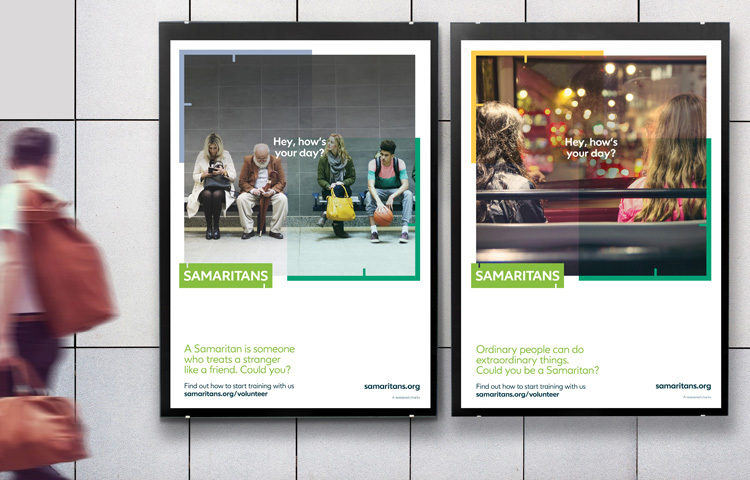 Alongside the Samaritans’ helpline, which people can call to talk to a volunteer listener 24 hours a day, the charity offers services including face-to-face, text and email counselling, support and information for those who are struggling or who are worried about someone else, as well as a programmes in schools, workplaces, prisons and the military. 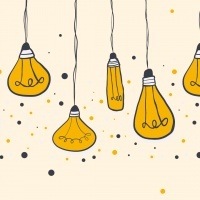 This includes talks, workshops for teachers on how to develop emotional awareness and listening skills, workplace staff training and online learning courses. 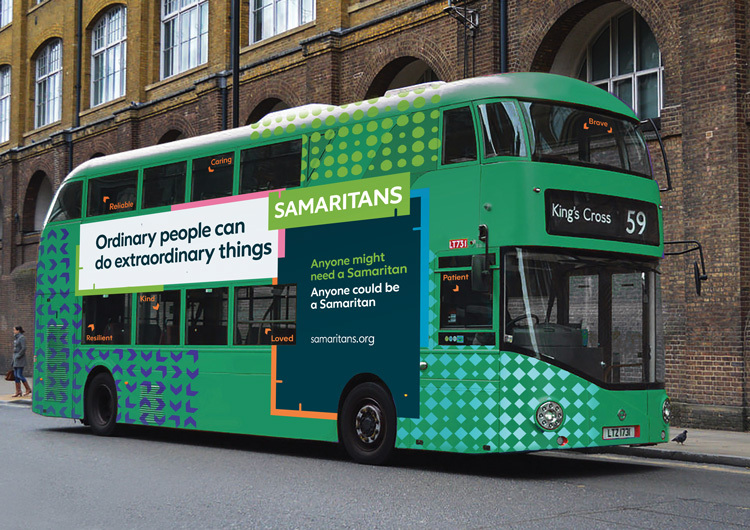 The main aim of the new brand is to help make the Samaritans accessible to a wider audience, particularly younger people, says Claire Biscard, creative director at Spencer Du Bois, and keep up with other charities in this space. Other mental health charities include Mind and Mental Health Foundation, while YoungMinds and Childline also offer listening services, particularly targeted at children and teenagers. 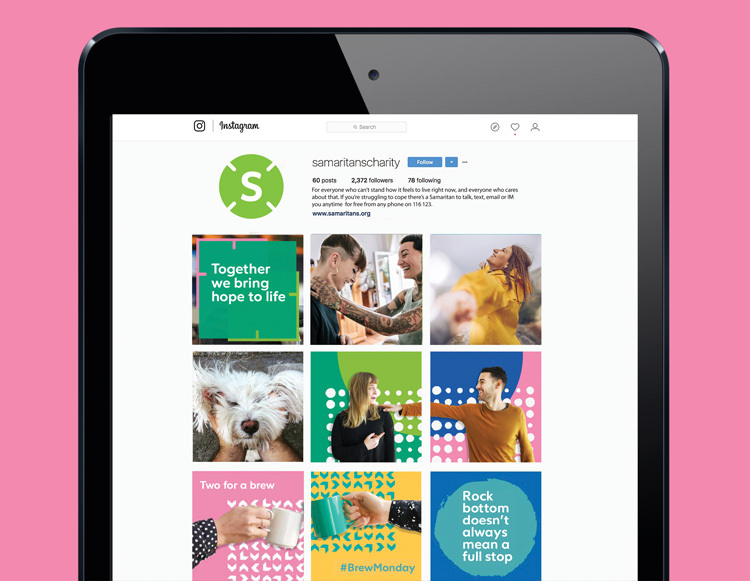 The new identity also looks highlight the extent of the charity’s work beyond its helpline, such as its suicide prevention workshops and online courses, to show how it “helps people before they reach crisis point”, adds Biscard. 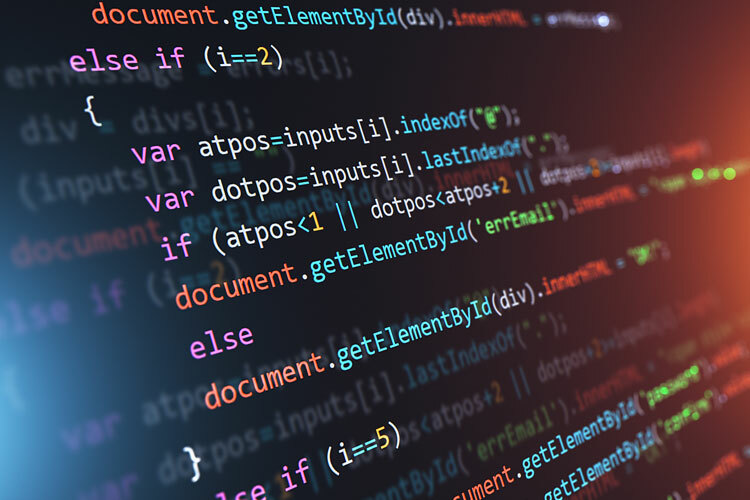 The new brand is focused around the concept of “human connections”, says Biscard, and features a range of connector-inspired graphics. The previous logo consisted of an all-capitals, bold, italic, sans-serif logotype set in green, which was framed by a hand-drawn box. 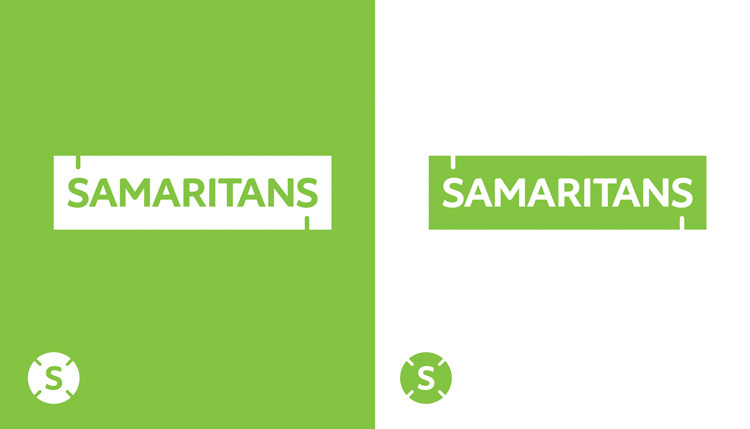 The new logo retains the Samaritans’ green colour for the background box, but sees a new bespoke logotype set in white against this. These colours are inverted depending on application. Small cut-outs or indents feature on either side of the box, representing connectors that could be used to slot different graphics together if they were printed. The logotype is Varah, named after the charity’s founder, and has also been used for body copy. The type features “quirky details” on its letters, such as inflected ends, which aim to give it a “sense of humanity” and reflect people’s “individual personalities”, says Biscard. An extended palette of darker and lighter greens, as well as pastel shades of yellow, orange, pink and purple has been incorporated, as well as an “overlapping graphic” concept, where graphics are laid on top of each other on posters and marketing materials. Indents feature on graphics across the whole identity, reinforcing the “connector” idea. 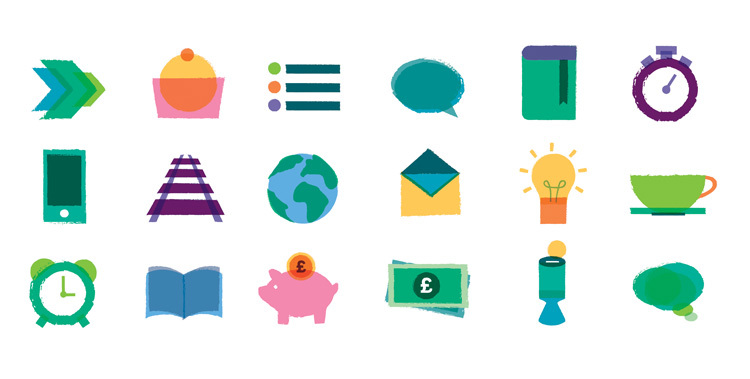 A range of icons including arrowheads, circles, semi-circles and diamonds have been used across the identity, as well as new illustrations that aim to be “vibrant”, says Biscard. New people photography has been used, which aims to show “real life situations” to emphasise “human connection” again. 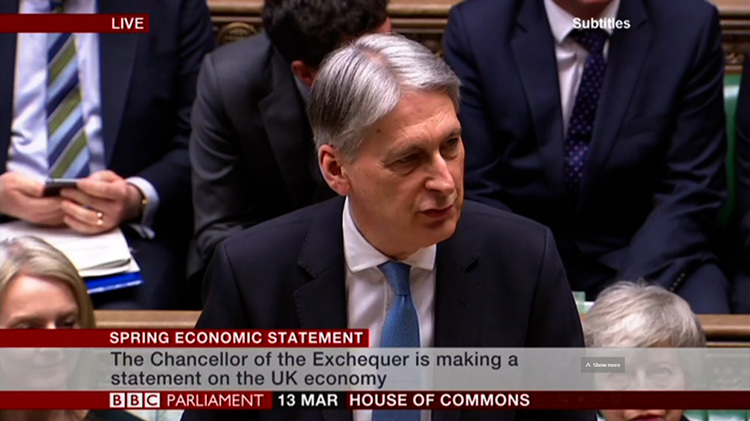 The tone of voice has been refreshed, looking to be “open, warm and hopeful”, she adds, with phrases such as “ordinary people do extraordinary things” included, as well as more playful and tongue-in-cheek ones such as “share a little humanitea”, used to advertise an afternoon tea event. Animated graphics have yet to be released. In a move to advertise the charity’s functions beyond its listening line, marketing focuses on other services such as its events, as well as promoting more holistic causes, such as encouraging people to listen to others in their daily lives or consider becoming a volunteer. 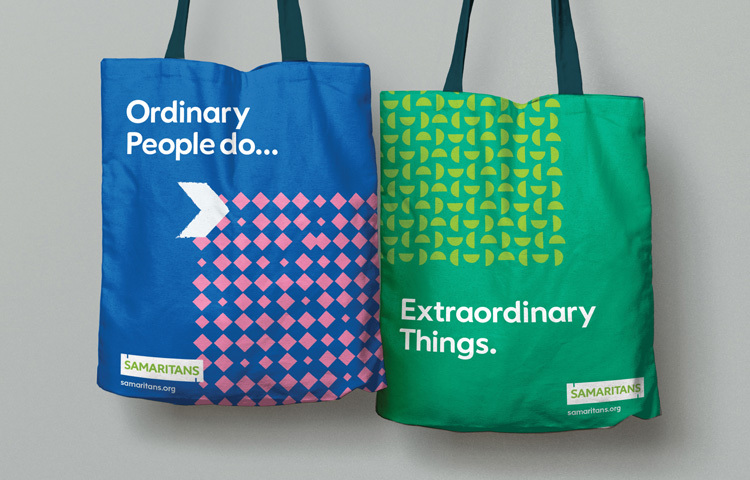 The new Samaritans branding is rolling out across all touchpoints, including the website and social media, print and advertising materials, merchandise, staff and volunteer uniform, and signage at events. I think this will really stand out where it’s needed most and surely that is what really counts. It feels fresh and hopeful. Last year I almost lost my best friend to suicide and Samaritans was one of the organisations that helped to save his life. I hope this rebranding project helps to save even more lives. From the perspective of a working graphic designer, and a counsellor in training, I think this project is spot on. It both looks great and it’s aim, purpose and refreshed core messaging goes way beyond the idea of merely rebranding for rebranding’s sake. Love it.